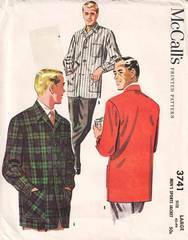 Vintage sewing pattern from 1956 for men's single breast sports jacket with cuffed sleeves. Men's Size Large, Chest 42.44, Waist 38-40. The pattern is used and complete. The envelope and contents are all in very good condition.